The LARGEST BLUEBERRIES OF ALL. Chandler regularly produces berries measuring 22mm across and weighing in at 5g per berry! An excellent variety for the home grower, the fruit ripens over a long period of 6 weeks, producing high yields with excellent flavour. Reliable heavy crops on sturdy rounded bushes. Blueberries, Cranberries and Lingonberries for Everyone! Trehane Nurseries, you've done it again! 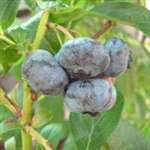 I have just received the most healthy, show worthy blueberry plants. They are laden with flower buds ready for opening. I am quite simply over the moon with the quality of the plants and with the most ingenious and careful packaging that I have ever come across. It's been a pleasure to buy from you again and will not hesitate to recommend you. Roll on Summer, my ice cream is waiting! As always Trehane provides the best quality plants, always well packed, prepared and presented. The chandler blueberry is incredible. It was delivered with massive berries and healthy leaves. I have used many gardening websites for plants but none of them reach the high standards of Trehane! Healthy plants arrive on your doorstep; it's z pleasure knowing you will be certain to get the highest quality for your well earned money! You csn't go wrong. Nice big plant ! Delivered safely, well packed and with abundant flowers. Plant was nicely delivered in a sturdy box and was in good condition with some flowers on.